In small glass bowl melt butter, about 30 seconds in microwave, then add cream cheese and return to microwave for about 15 seconds or until softened. In separate large mixing bowl whisk together flour, baking soda, salt, baking powder, and both sugars. Beat eggs and add to flour mixture, then add butter and cream cheese. Fold all ingredients together adding white chocolate chips, until well mixed. Cover and refrigerate at least an hour or until dough is completely cold. (You can refrigerate this over night). When you are ready to bake and dough is cold, roll dough into 2 to 2 ½ inch balls and place on lightly greased cookie sheet. 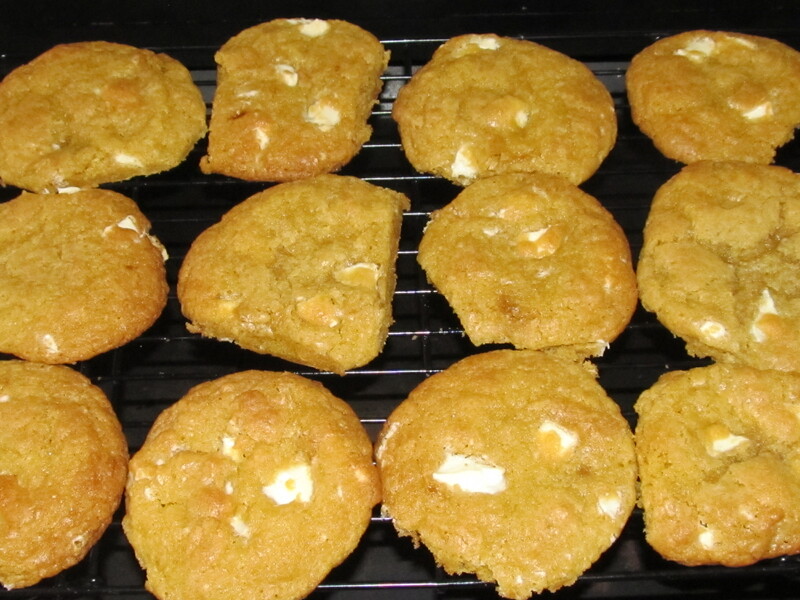 I used an air bake sheet, and bake for 12- 14 minutes or until cookies are completely brown. Remove from oven and let cool. Cookies need to cool completely, to set. (That is if you can let them, WARNING, these can be seriously addicting!) Makes about 3 dozen cookies. These look really good, but every time I’ve tried to make chocolate chip GF cookies they have come out really flat and either won’t hold together or they are hard. I know I had the same problem, until I figured it out. If you use half butter and half cream cheese it keeps them from going flat. If you will let them get golden brown, just like in the picture, then they will not fall apart and they will not get hard. When they are cool just store in your cookie jar or air tight container. If they last long enough to store! Please Note: I have only had this success with the flours listed! !